Ray Pecor, Jr./Vermont Expos, Inc. The Vermont Lake Monsters are a minor league baseball team in the Short-Season A class New York–Penn League affiliated with the Oakland Athletics. The team plays its home games at Centennial Field, one of the oldest stadiums in minor league baseball, on the University of Vermont campus in Burlington, Vermont. The team was located in Jamestown, New York, (as the Jamestown Expos) from 1977 to 1993, and was an affiliate of the Montreal Expos/Washington Nationals from its founding until September 2010, when it became an Athletics affiliate. In 1993, Burlington businessman Ray Pecor, Jr., the owner of Lake Champlain Transportation Company in Burlington since 1976, purchased the Jamestown Expos and moved the franchise to Burlington, retaining the Expos name. The Vermont Expos played their first game at Centennial Field on June 16, 1994. More than 5,000 people attended the home opener—a 6-5 loss to the Pittsfield Mets. The Montreal Expos announced on September 29, 2004, that they would move to Washington, D.C., after the 2004 season. They would rename themselves the Washington Nationals. Minor League Baseball gives clubs 60-days after the end of the season to change their names and logos. Vermont did not have enough time for an identity change and retained the Expos nickname for the 2005 season. During the 2005 season, the club announced its plan to change the nickname and solicited suggestions from its fans. The team received 30,000 fan suggestions for the new name via a name-the-team contest. 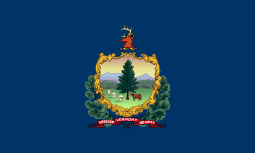 The New York Times reported that the two leading contenders were "Green Mountain Boys" and "Lakemonsters". At the end of the contest, the winning name was "Champs", but as the team had not made the playoffs at that point since 1995, management did not think it was appropriate. They announced the new name, "Lake Monsters", and revealed the new team colors and uniforms on November 15, 2005. The Expos colors of red, white, and blue were replaced with the Lake Monster colors of navy blue, Columbia blue, and lime green. The name references Champ, the legendary Lake Champlain monster which had been the team's mascot since 1994. The club's last game as the Vermont Expos was on September 8, 2005. They opened the 2006 season as the Vermont Lake Monsters. The franchise was the last professional ball club to carry the Expos name. The team's home ballpark, Centennial Field, is 100-miles from the Montreal Expos' last home ballpark Olympic Stadium—closer than the Boston Red Sox' Fenway Park. While baseball fans in Burlington tend to root for the Red Sox, New York Mets, or New York Yankees, Montreal was the closest Major League Baseball team until moving to Washington, D.C., 2005. On July 22, 2005, the Vermont Expos held its first "Tribute to the Expos" promotion and honored Andre Dawson at Centennial Field. While the club changed its name to the "Lake Monsters" in 2006, the organization held its second "tribute to the Expos". The club honored pitcher Dennis Martínez and wore powder-blue Expos uniforms with the Expos name on the front and a Lake Monsters patch on the left sleeve. On August 5, 2007, the Lake Monsters honored the Expos again and brought Tim Wallach to Burlington. Following the 2010 season, the Lake Monsters ended their affiliation with the Nationals and entered into a new player development contract (a working relationship between Major and Minor League teams) with the Oakland Athletics. This marked the first new MLB affiliation in the Lake Monsters' 17-year history. 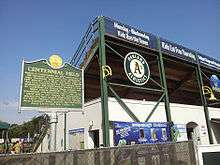 Vermont began its first year as an affiliate of the Oakland A's in June 2011. 1995: Defeated Hudson Valley 2-0 in semifinals; lost to Watertown 2-1 in finals. 1996: Defeated Pittsfield 2-0 in semifinals; defeated St. Catharines 2-1 to win championship. 2011: Lost to Auburn 2-0 in semifinals. ↑ Kilgore, Adam (September 21, 2010). "Nationals Sign Rookie Ball Agreement With Auburn". The Washington Post. ↑ Donoghue, Mike (September 21, 2010). "Oakland Affiliate Bound For Burlington: Washington Nationals Move N.Y.-Penn League Team to Auburn". BurlingtonFreePress.com. ↑ Lynam, Julia (July 2004). "Uncommon Carrier". Business People-Vermont. Retrieved 2009-03-02. ↑ "A Million Reasons To Go To an Expos Game". Vermomt Business Magazine. March 3, 2001. Retrieved March 2, 2009. 1 2 Leonhardt, David (September 8, 2005). "The Last Team With the Expos Nickname Will Play Its Final Game". New York Times. Retrieved March 3, 2009. ↑ "Vermont Lake Monsters Replaces Vermont Expos". OurSports Central. November 11, 2005. Retrieved February 24, 2009. ↑ Bibeau, Mathieu (July 31, 2008). "Tribute to the Expos in Burlington, Vermont with Tim Wallach". Encore Baseball Montreal. Retrieved February 24, 2009.